Impressive finger-picking on original melodies, filled with joyful enthusiasm. Bob Lawyer is an acoustic guitar player from Milwaukie, OR. He has been composing and performing on guitar for over 40 years. He has played a wide variety of styles, ranging from rock, in the band "Flight United" to folk in the bands "Ole and The Scandinavian Hot Shots" and "Wie Kommer In Frit". In addition to 6 string guitar and 12 string guitar he also performs on banjo, harmonica, piano and sitar. Stylistic influences are Leo Kottke and James Taylor. As a studio musician he performed on the albums "Lead Me To The Light" and "Sing Me A Song". 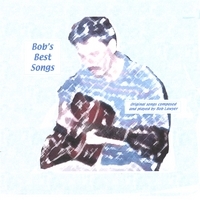 His most current album, "Bob's Best Songs" is on the Fat Fish label.